Featuring the Grand Opening of The Italian Presence Exhibition, which will run for 18 months. 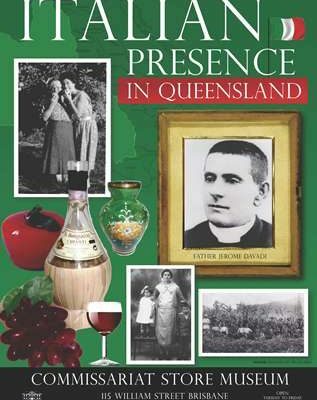 This event will also feature talks from prominent historians on Queensland’s Italian heritage including Dr Catherine Dewhirst and Dr Stefano Girola, and the launch of Marilyn England’s new book based on Toowong’s history. Cost: $15 (members) and $20 (non-members) includes a light lunch. Please RSVP as soon as possible as seats are limited.